Mara Dyer! I loved the first book, and I can't wait to get my hands on this one as well. I love the cover, and am glad that it is so similar to the first. HURRY OCTOBER! Thank you to Kathy for pointing out the cover to me. I completely missed the reveal! I posted the cover on my blog yesterday and I have to agree with how gorgeous it is! This is pretty small, but I just love those bubbles by the girls arm at the top. Weird, but it just looks so cool! *jumps up and down* I can't freaking wait for this book! Mara dyer blew me away and I love this cover so much! The blues are eerie and ... how longer do we have to wait??! Check out my Waiting on Wednesday post here. I love that the cover follows in the same path as the first book. There's a uniting theme. Can't wait to see what happens with Mara next! Swoon! I love this cover so much. I also LOVED the first book and can't wait to get my hands on this. AMAZINGLY AWESOME choice Christy! If only October would HURRY UP and get here. Everyone is freaking out about this one. I have to hurry up and read the first one to figure out what I'm missing. Oh, heck yes! The first book melted my brain! I can't wait for this one to do the same! Great pick! Isn't this cover gorgeous?! I love that the style is so similar to the first book - I was scared they couldn't create an equally gorgeous cover, but they totally managed. Aaaaah, dying to read this sooooo badly. And the summary just makes this worse! I wasn't a huge fan of the first book but I'm still really curious about this one. The cover is lovely! I just read the first Mara a few weeks ago and I LOVED it! I can't wait for book two either.....so excited! I'm really glad the cover is similar too, it will match the first one nicely! I still haven't read book one, but I have it on my TBR and can't wait to get started. Great pick :). I still need to read The Unbecoming of Mara Dyer, but I'm going to wait until the release of this one to get closer. I've heard a lot about a 'horrible' cliffhanger, so I want to make sure the sequel won't be too far away. Great pick! I can't wait for this one as well. The Unbecoming of Mara Dyer was my favorite book of last year and I'm dying to know what happens next. 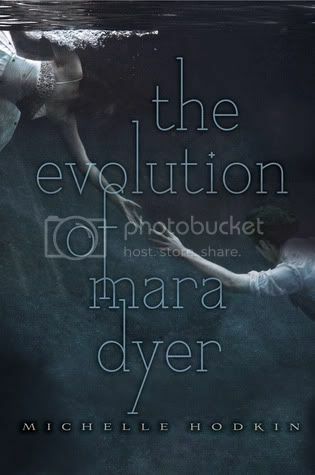 I absolutely can't wait for The Evolution of Mara Dyer too! So in love with the cover, I was glad it's in a series with previous one. Yes! I'm so psyched for this. The first book was a complete mind eff and I want to know what is going on lol. And I love the continuity of the covers!